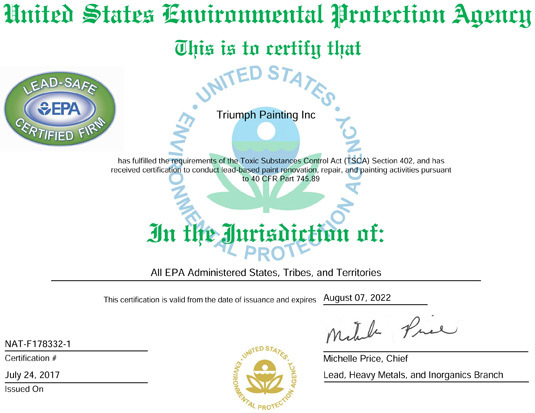 Triumph Painting is Lead Certified, trained and registered with the EPA in Minnesota, ensuring that your project is done safely, correctly, and is protected from fines. Having passed lead paint management training, the lead paint removal professionals at Fresh Paint Inc. go above and beyond to ensure your painting project is completed to the highest standards. Many painting contractors in the Minneapolis / St. Paul area may claim to know how to safely handle and dispose of lead-based paints, but only a few are actually lead certified. Which Lead Paint Projects Do These Rules Apply to? The renovation, repair and painting of houses or building structures built before 1978 must get certified, along with all child-occupied facilities.